Learn to make jam with foraged berries from our local hedgerows – including rowan berries, hawthorn berries, sloes, blackberries, elderberries and apples. 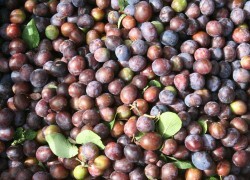 We will also learn to make sloe gin and rhubarb schnapps to give as fun Christmas gifts. As the workshop will be hosted in Transition member Sara’s home, spaces are limited so please email sara.ayech@gmail.com for more info and to book a place. The workshop is free but we are asking for a £3 donation for ingredients. If you would like to take some jam and gin/schnapps away, please do bring a clean jam jar, a small (quarter) bottle of gin or vodka, and an empty kilner jar. « Come harvest with us – lunch, growing advice and chickens!